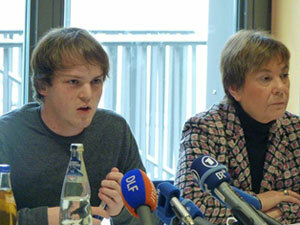 Elisabeth Kahler and Christian Humborg work with Transparency Germany and prepared the launch of “universitywatch”. Berlin: Until 2011 Deutsche Bank funded two endowed chairs, one at the Institute for Applied Financial Mathematics at the Humboldt University Berlin and one at the Technical University Berlin. The steering committee named to appoint the chairs represented both sides in equal numbers: two representatives of the bank and two professors of the universities. But in a stalemate, a representative of the bank had the final say on who got the job. Potsdam: Defense company EADS holds a 25 percent share in the Institute for Society and Security (BIGS) at the University of Potsdam. The partnership agreement stipulates a 75.1 per cent majority for all important decisions, meaning that EADS’ approval is necessary. Cologne: Pharmaceutical company Bayer sponsors cancer and heart research as well as training of doctoral students at the University of Cologne with a six figure sum annually. Why Bayer does so and what kind of rights Bayer holds is not clear. For several years the University and Bayer have been blocking the publication of their contract despite freedom of information requests seeking details. The pending court case to get this information published is supported by Transparency Germany. All these cases have made it into national press. But that leaves open the question: what about smaller cases? Are there more instances where the influence of private interests on science and education is much more subtle, or just less publicised? In January, Transparency Germany, the German newspaper Tageszeitung and the Freier zusammenschluss von studentInnenschaften (fzs), the nonparty umbrella organisation of student representatives in Germany, launched their new “universitywatch” platform, in German, hochschulwatch.de. Hochschulwatch.de works just like Wikipedia. There is an entry for each of the 374 German universities and colleges. Whoever has information on corporate connections like those mentioned above can edit the entries of the universities and fill in details of the company connections. Before amendments are publicly activated tageszeitung gives it a legal review while also scouring the reports for interesting hints and story tips. “Arts and sciences, research and teaching shall be free”, says Article 5 of the German constitution. However, we do not know the conditions laid down in the contracts between universities and companies. It is vital that these contracts do not comprise a university’s independence with a requirement of approval for the choice of professors and project managers, or the publication of research results. When asking the universities from which companies they receive their funding, it is hard to get an answer because they say their hands are tied, “due to the consideration for the interest of our business partner.” Transparency Germany demands that all contracts between universities and private companies be published. ← ‘Putting in a good word’: the most acceptable form of corruption?